'eXtra fiRM' is out on Simlog. 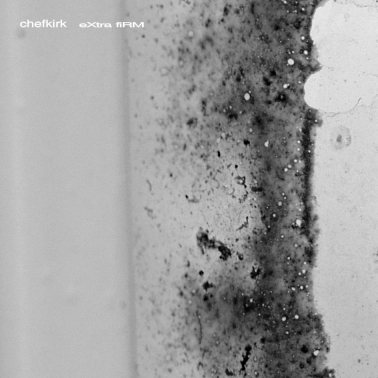 If the title of a CD should mean something, than I am not sure what 'Extra Firm' means in the case of this new CDR by Chefkirk. Chefkirk, aka Roger H Smith, is a man who has come a long way from his earliest noise doodlings, which didn't really impress me, to his recent somewhat more balanced style of rhythm and noise, in that order. So I feared 'Extra Firm' would see his return to his old noise style, but this is not the case. His continues his recent route of exploring short, repeated sounds and takes his sources, I think from field recordings. Rumbling in the basement on a stack of metal or wood, and upstairs the computer is waiting to treat these into smaller blocks of sound. Occasionally leaping into a Pan Sonic like rhythm. Less refined than our Finnish friends, Chefkirk never comes close to any sort of techno rhythm, but at least he manages to sound like something of his own. The progress forward and upward continues.